Sometimes, a product’s design is so intuitive and useful, it’s hard to ignore. Such is the case with the newest addition to the CableJive lineup, the MiniDock. Developed by our friends over at BlueLounge, the MiniDock made waves in the tech web-world over the last couple of weeks, with popular sites such as Engadget and Cult Of Mac heralding it’s simplicity and brilliance. And today, we’re proud to announce that the MiniDock has joined the CableJive lineup. Sick of inconvenient outlet placement forcing your beloved iDevice onto the floor? Searching for a cleaner looking, more polished charging solution for your iPod or iPhone? Then look no further than the MiniDock, available now! CES 2011 was groundbreaking for CableJive and we loved every minute of it. However, it became clear pretty quickly that visually speaking, our booth left something to be desired. Surrounded by incredible setups from companies like Griffin and Mophie, it became quite apparent that in 2012, we would have to step our game up. Gotta love getting deliveries away from the warehouse. 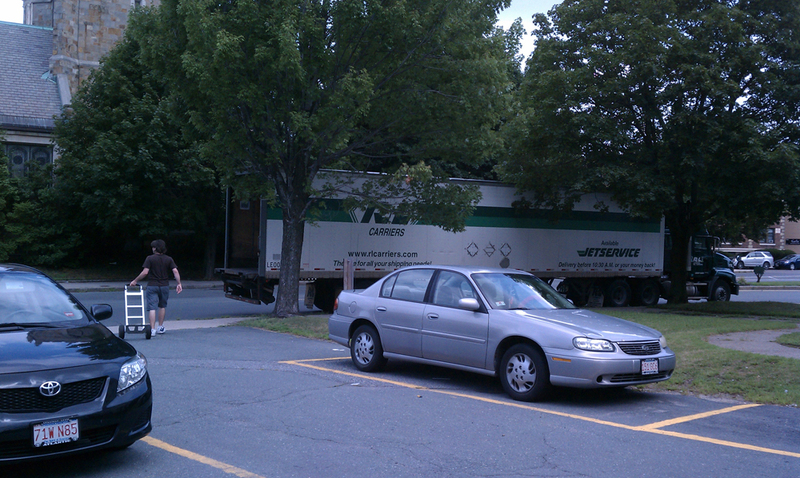 Nothing like seeing an 18-wheeler try to find street parking. The structure came in these huge crates, each weighing over 100 lbs each! Good thing our elevator works. Well, you’ll have to wait and see what the end result looks like. Not giving away the big surprise yet. Stay tuned here for the latest on our CES 2012 prep! The dockStubz is a handy little product that can be used in many different ways. Our dockStubz: The Problem Solver video series highlights some of the ways this little adapter can be used to fix some annoying issues you may be experiencing with your iPod or iPhone. Episode 1 focused on how the dockStubz can help get your encased iPod or iPhone connected with your favorite speakers systems or other accessories without having to remove said case. In Episode 2, we display the dockStubz’s “charge conversion” functionality, and how it can help get your newer iPod and iPhone devices charging with older docks and systems. Check it out and tell us what you think! Being a company that sells cables, we understand that when you acquire (and frequently use) many cables, things can get a bit out of hand (tangled in some cases, chaos in others). Thankfully, we also have the cable management side of things covered, with CableDrops, CableClips, and the Cableyoyo. While there are certainly some beautiful product photos up there, I figured I’d throw up a “real world” pic of all the ones I use fairly regularly. They’re super handy if you find yourself dealing with cable-mess. Also, the Nest snuck in there for good measure, as it’s always right on my desk as well.